The only thing I have to say about Allegiance is this - it was fantastic! Books like Allegiance are the reason I love to read - it takes me to another world! When it comes to a series, I usually try to get my hands on the previous books so I can read them in order but didn't have the time to do that with this one. So yeah, I haven't read Legacy yet but still thoroughly enjoyed Allegiance! This is a magnificent historical fiction that revolves around two kingdoms, war, love and royalty. Really, what more do you need? Alera is an excellent character - loyal, strong and valiant but also has the flaws that go with the lack of maturity that any young girl would face. 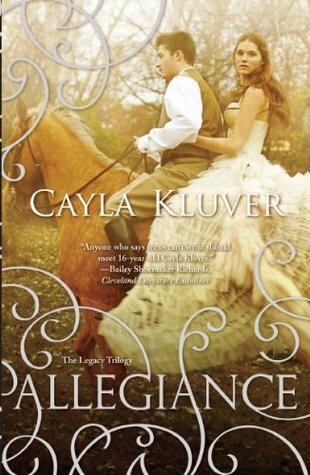 Kluver has created an amazing world full of secrecy, jealousy, love and betrayal. I was utterly captivated! This is the first time where I haven't read the first book and still got really involved/attached to the characters. I have to say, Kluver's writing is exceptional. I guess this may not be for everyone, but I'm a sucker for royalty and court drama which is why it's no surprise that I love Tudors (yeah, I'm referring to the TV show). All I can now think of is, I HAVE to get my hands on Legacy!